The earliest mention of a Catholic bishopric in Bosnia dates from 1089 (i.e. from the 11th century). It was called Bosnian Bishopric, and its center was in Vrhbosna (today's Sarajevo). i.e. Silver Bosnia. Since the 19th century its site is in Sarajevo. This very old name was derived from the name of the city of SREBRENICA which in pre turkish times (before the end of the 15th century) had been known as an important Catholic center in north-eastern Bosnia (in Croatian srebro = silver). Medjugorje is nestled between two hills, Krizevac and Podbrdo. 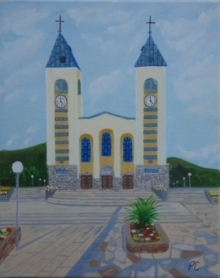 It is home to the parish of St. James which serves the villages of Medjugorje ( Međugorje ), Sivrici ( Sivrići ), Bijakovici ( Bijakovići ), Vionica, Miletina and Surmanci ( Šurmanci ). The name “Medjugorje” in Croatian means “between the mountains”. Until the early 1990s, most families survived by raising livestock, growing tobacco and cultivating grapes for wine. The small remote village of Medjugorje (Med-jew-gor-yay) /Međugorje/, judging by the caves around it, may have been inhabited since the older Stone Age period. The village is situated in Bosnia- Herzegovina, a former Yugoslavia republic (now a parliamentary democracy). This part of Croatia is rugged and rocky with low-lying vegetation, dense evergreen underbrush, and little forestland.